Millions of lines of code - written in different languages by different people at different times, and operating on a variety of platforms - drive the systems performing key processes in our society. The resulting software needs to evolve and can no longer be controlled a priori as is illustrated by a range of software problems. 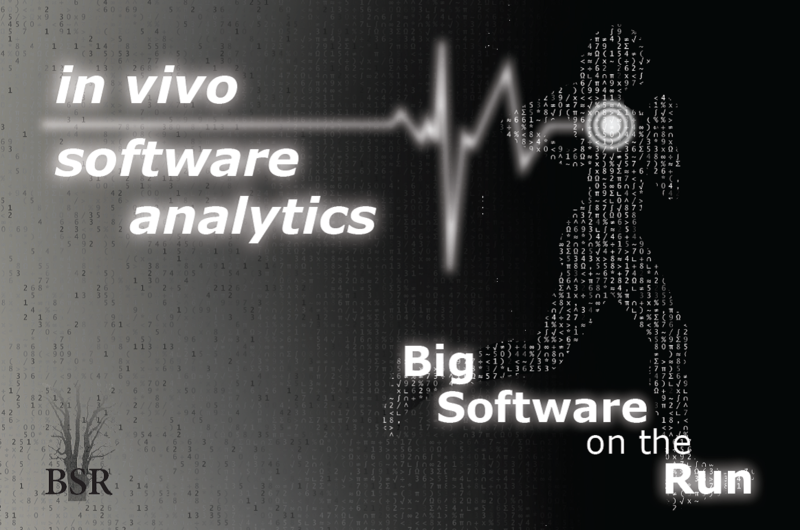 The 3TU.BSR research program will develop novel techniques and tools to analyze software systems in vivo - making it possible to visualize behavior, create models, check conformance, predict problems, and recommend corrective actions. Our BSR project meeting took place on Thursday January 11th, 2018 in Utrecht. Check the updated list of the project outcome. The first CFP of our 2nd summer school is out! A big event with 8th Europeen Business Intelligence & Big Data Summer School (eBISS 2018). Join us in the beautiful Berg en Dal! Arnd Hartmanns received a Veni grant to work on “Verification of Cyber-Physical Systems: Exploiting Uncertainty for Scalability”. Congratulations Arnd! Xavier Devroey joind BSR project as a postdoc at TUDelft. Welcome Xavier ! After the successful BSR winter school 2016, we will organize the second edition of a BSR summer school in conjunction with Erasmus-Mundus Exchange program. Date: July 1st-6th, 2018, Location: ParkHotel, Berg en Dal, the Netherlands. More details will follow. For now just book the dates! Prof. Marieke Huisman received a Vici grant to work on improving the reliability of software. A Vici grant is one of the largest individual contributions in the Netherlands, intended for experienced researchers who have successfully demonstrated to develop an innovative line of research. More information on the BSR infrastructure & its usage are now available. More information about all BSR datasets that are publicly available. The proceedings of the BSR winter school is now available online on the BPM center. Our BSR winter school was more than successful! Many thanks to our speakers, participants and BSR team for the hard work! materials and pictures can be now downloaded. Our next BSR winter meeting will take place on January, 27th, 2017. The BSR winter school is taking place from October 23rd to October 28th at Hotel de Paasberg, Ede, the Netherlands. The application for the BSR winter school is now closed. We received 56 applications and accepted 34 in total. On October 04, the BSR autumn project meeting took place at TU/e, Eindhoven. Last chance to apply for our BSR winter school. Few places are available. Our BSR paper titled Evolutionary testing for crash reproduction won the best student paper award at SBST 2016. The preliminary program of the BSR winter school is now available. We are participating in the poster session at EDF 2016. Check out our BSR article in Bits and Chips magazine. Our next BSR meeting will take place on June 24th at University of Twente. The winter school second call for participation and flyer can be now downloaded. The list of speakers at our winter school is online. Our next next Phd program day will take place on June 1st in Utrecht. More collaborations and hard work are awaiting us! We are organizing a PhD program day that will be held in conjunction with the BSR meeting on March 23rd - 24th at Delft University of Technology. On December 04, the second meeting took place at TU/e, Eindhoven. On September 15, the kick-off meeting took place et TU/e, Eindhoven.